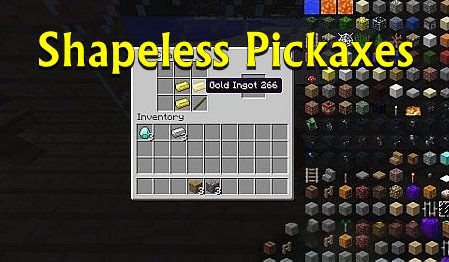 The Shapeless Pickaxes Mod adds Shapeless Crafting for pickaxes into Minecraft. Now you can place 3 diamonds anywhere in the crafting table with a stick and it makes a Diamond pickaxe. Do this with any pickaxe material to make a Shapelessly crafted pickaxe. Install Minecraft Forge 1.6.4-9.11.1.916 or higher. Now run Minecraft with the Forge 1.6.4-9.11.1.916 profile to download all the folders needed for forge to work. 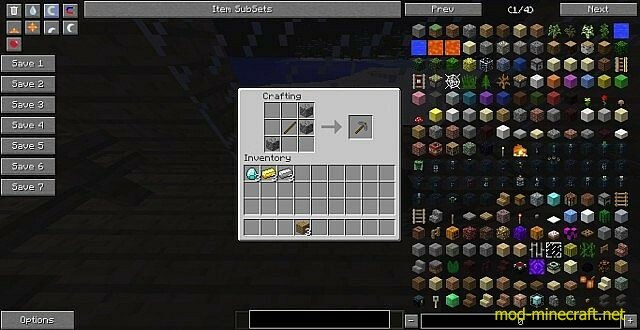 Next go to .minecraft and drag the ?Shapeless Pickaxes Mod?.jar file into the mods folder. Run Minecraft and your mod is installed.